EVO COMFORT Scooter With Seat Is Voted Best Outdoor Product By Parents!! 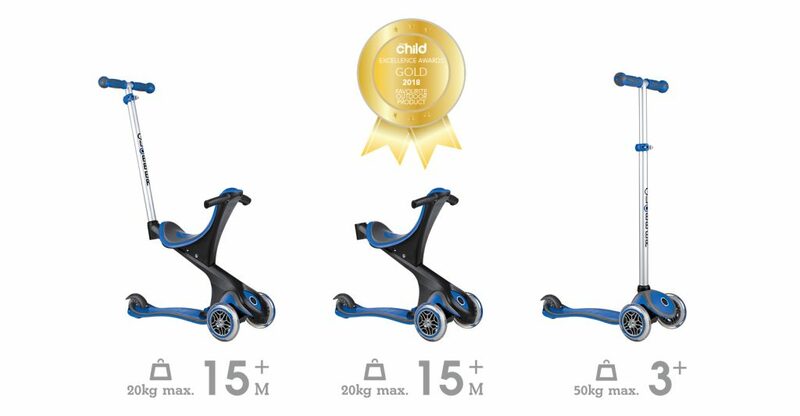 EVO COMFORT all-in-one 3-wheel scooter for kids was voted best outdoor product during the Excellence Awards 2018 by My Child, a renowned Australian magazine which aims to help parents by providing parenting tips and product information. More than 22,000 parents voted for their favourite product on My Child’s website and EVO COMFORT was voted No1! What’s So Special About Our EVO COMFORT Scooter With Seat? EVO COMFORT scooter with seat offers pushchair, walking bike and scooter all-in-one for maximum product usage for parents, without compromising on safety, style, and comfort! Its extra-wide seat and seat support bar (to simultaneously move the seat upward and backward in 3 different heights) make it extremely comfortable for your little one. This toddler scooter also has a removable footrest to avoid shoes dragging on the ground in pushchair mode! What’s more, it also comes with a patented steering lock button for easy learning; front wheels lock to only move forward and backward, so your child can quickly learn to balance, and a 4-height adjustable T-bar makes it the ultimate 3-wheel scooter for up to 9+.